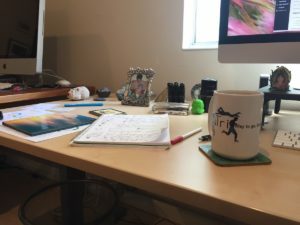 If you are like me you find that things in your office tend to go through waves of increased clutter as time passes, slowly making work more difficult. Either that or there are clutter-fairies that fly in when I’m not looking and mischievously add things to piles, tangle cables, open 30 new tabs on my browser, overflow my gmail, turn on my phone and desktop notifications, add 12 random files to my computer desktop, and add extra pens and books to my desk. OK, I know it’s really me making the mess, but it’s more fun to blame it on the clutter-fairies. All those things drain both Creativity and Productivity. How? Every one of those things causes a small decision to be made every time I look at it: am I tired enough of looking at that thing to file it, read it, clean it up? Those small decisions add up and slowly but surely drain my mental reserves. That slows me down, i.e. I’m less productive, and it reduces the amount of creative energy I have for real tasks. Are You Blocked on Procrastination and Distraction? Learn Our Top 3 Ways To Instantly Boost Creativity and ProductivityOnce You Know Your Productivity Style You Can Learn The Best Way To Become More Productive In Your Creative Business. Click here now and reserve your seat! For inbound paperwork, if it can be done in 60 seconds do it right away, otherwise have one, single, neat filing space for ongoing items. That might be an inbox tray, a filing box, or a file at the front of your filing cabinet. You need to be religious about this, otherwise, the clutter-fairies take it as a signal that they can wreak havoc on your workspace. For your computer make absolutely sure that your downloads do not go to your Desktop. Do not save files to the desktop. Just don’t. At a minimum have them go to your downloads folder. If they’re important put them in an appropriate subfolder. For your phone, you can either take the nuclear option and disable all app notifications (this will be in the notifications settings for your phone) or perhaps more simply just learn how to use your phone’s “do not disturb” feature (iPhone, Android). For your desktop, there are two things to do. First, stop leaving so many tabs open … especially ones like Facebook! Many tabs can play audio or cause notifications (if you’ve permitted it), plus they represent a lot of visual clutter. Second, learn how to toggle your desktop notifications (mac, windows). This trap is all too easy to fall into. You’re tired at the end of the day and just ready to walk away … but it’s the perfect time to do something menial but tremendously effective. Do that paper filing. Clean up your computer desktop, shutting down tabs, programs you are done with, and shutting the computer down if you want. Think about future you tomorrow morning and how much they’ll appreciate that you not only kept the clutter-fairies at bay, but you left a calm, clean workspace to start the day with. There are myriad things you can do to increase your productivity and creativity. I’m of the opinion that the simplest ones can yield the greatest impact. Things like keeping your physical and computer workspaces neat and clean support everything you do. 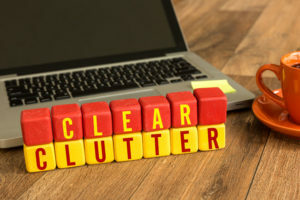 Jump in the comments below and let me know what’s in front of you that shouldn’t be, and any simple systems you use to keep the clutter-fairies from blowing up your office overnight!